As someone who attended a number of events and conferences, Ashlee Ammons found that mixers were usually anything but, and often times counterproductive. She and her mother, Kerry Schrader, knew there had to be a better way to make meaningful connections at important events. 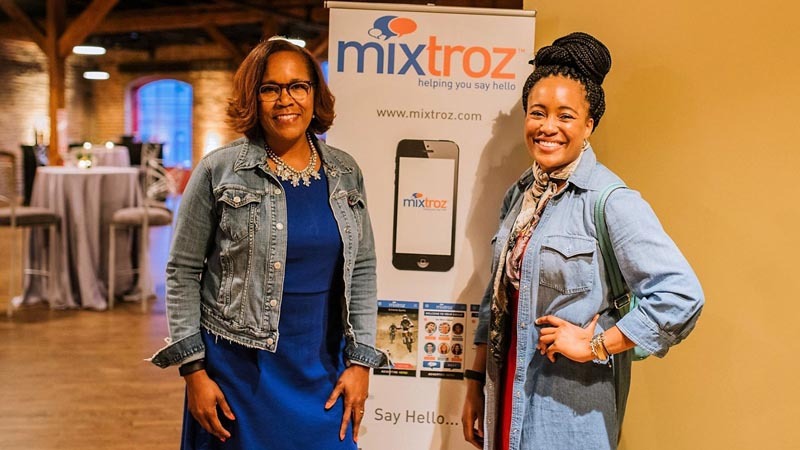 A long conversation led them to found Mixtroz, an event app that forges purposeful conversations and relationships at large events, enterprises, and even universities. LIFT Labs: Give us the Mixtroz elevator pitch. Ashlee Ammons: We recognize that people go to a lot of mixers and events today, but they actually don’t mix. It’s this crazy phenomenon in 2018 because we’re so into our tech and doing what’s comfortable. So, we’ve made the event process more valuable for both organizers and attendees with software that drives people from their phones to face-to-face in real-time while collecting data. LL: What led you to found Mixtroz? AA: Mixtroz stands for mixer and introductions smushed together. I went to a conference in 2014 and over lunch the event organizer said, “Okay, we’re gonna do some networking. Go up to somebody with the same color dot on their name tag as you.” The process to do that was just so clumsy I didn’t end up meeting anyone, which was my whole point for going to the event. I talked to my mom about it, who is a former HR executive, and we stayed on the phone for four hours talking about this problem and if there was something that solves the problem. There wasn’t. So, we built it. LL: Who are some other leaders that inspire you and why? AA: Sara Blakely [founder of Spanx] has to go on the list because of how she approached her problem. One thing she said that’s been inspiring to me is, “I didn’t know the most about fashion when I started Spanx, but I cared the most to solve the problem.” Similarly, we didn’t know the most about tech when we started the company, but we cared the most to solve the problem. You don’t have to know the most about something to solve the problem. My mom and I also look at Misty Copeland, the ballerina. She has a quote, “You can start late, look different, be uncertain, and still succeed.” Misty Copeland is killing it. She doesn’t look like anybody else, but she hasn’t let that stop her and actually used that as an advantage. LL: What’s one lesson that you’ve learned through founding Mixtroz that’s been the most impactful in your life or your career? AA: I would say that there’s this stereotype, I think when people hear the word entrepreneur, we’ve been so flooded with imagery of Mark Zuckerberg or the founders of Snapchat or Tinder. You get this one mental picture in your head and you’re like, wow, this person stayed up all night coding for a few weeks and then they have a billion-dollar idea. The truth is that entrepreneurship is a marathon, 100%. You hear a ton of no, before you get anywhere near a yes, generally. One of the things that I’ve learned is, whether you’re going to be a company that scales to 10X or you’re just going to build a comfortable lifestyle business, should the road be hard? Yes. Should it miserable? I’ve learned that if misery is part of your day-to- day in being an entrepreneur, then you need to shift something. LL: What’s the top goal that you want Mixtroz to achieve in the next 12 months? AA: The biggest and most immediate is we literally just opened a seed round of funding that is so crucial and important for us. We know what the stats are for women, specifically black women, we know what we’re up against. I want to close the round of funding so I can just go work harder. It’s the craziest thing. Everyone thinks you close a round of funding and then you’re going to the south Riviera in France and just hang out. I’m like, no. I’m trying to close the round of funding so I can work harder and scale this company more efficiently and effectively! LL: What advice can you offer for future female leaders? AA: I’ve got a ton, I could print a book. I think the biggest thing is just start. Don’t let the fear of the unknown stop you from getting to what your passion point could be. Being an entrepreneur isn’t about reinventing the wheel, it’s about changing the way that it spins. LL: Do you have any go-to business or personal podcasts? AA: I literally start every single morning with Up First by NPR to get a high touch of what’s going on. Another one I love is How I Built This, which helps me get through some of my entrepreneurial depression. Then I just love to feed my mind, so I listen to a lot of Stuff You Should Know, Masters of Scale, and The Pitch. Mixtroz Founder Reel from Ashlee Ammons on Vimeo.